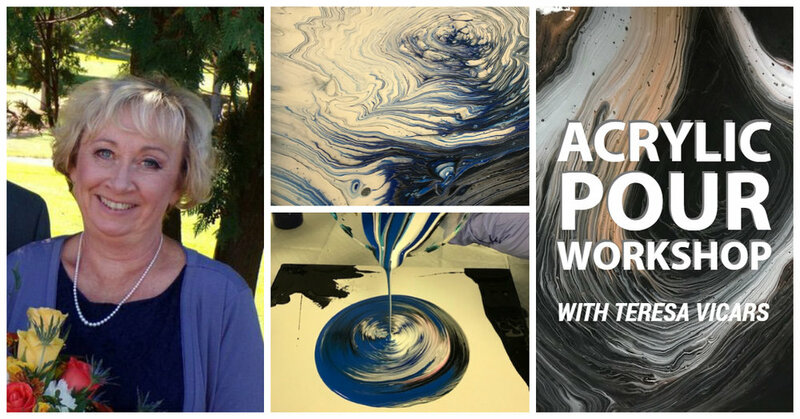 Artist Teresa Vicars is returning to Town Square Community Center to demonstrate her unique acrylic pouring techniques at a one-day workshop on Saturday, March 16 from 9:30 am to 12 pm. Cost of registration is $50 and includes all materials. Participants may sign up online at www.greenlakerenewal.org/. The goal of this workshop is to practice acrylic pouring, a popular painting technique that is very simple and results in beautiful works of art. This is a great way to smooth out unwanted texture, get marbleized effects, rich colored glazes and add some fun to any painting process. Participants will be provided with materials of the highest quality and can expect to leave with two finished composition. To learn more, click here. This class is made possible in part by the generous supporters of Green Lake Renewal, the 501(c)3, non-profit community revitalization organization that manages Town Square Community Center. For more information on programs like this, call 920-807-0008 or visit www.greenlakerenewal.org/events/.